Mera Peak is gazetted as Nepal’s highest trekking peak and sits in a perfect position for the most magnificent panorama of Himalayan giants; Everest, Lhotse, Nuptse, Makalu, Baruntse…the list is almost endless. This is a very achievable objective as your first expedition or as the pinnacle of your alpine trekking/skiing aspirations. This is a trip aimed at private groups of 2 to 8 people. 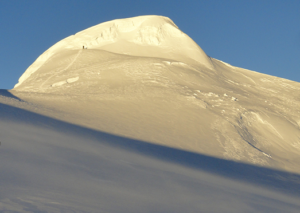 It’s a medium length, enjoyable trek with a few days skiing above 5000m once our bodies have adjusted to the height. 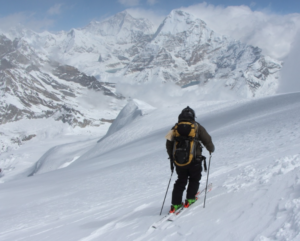 A great way to see and experience Nepal, with the added bonus on a easy ski descent. Skiers/boarders and non-skiers are welcome to join. Every day of the expedition resonates with new and interesting experiences whether it is a short stop to chat with local people on the trail or the thrill of a new and majestic view around each corner. The journey starts with a short flight from Kathmandu to Lukla, delivering us directly to the Khumbu valley and the start of our exhilarating voyage through the Sherpa homeland. Initially we weave our way through arable fields where we can observe subsistence farmers tending their crops and animals. Later we climb through forests and small mountain villages on our way towards the mountain. 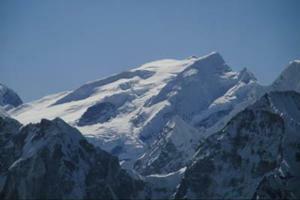 From Mera Peak Base Camp we establish two mountain camps, the top one from which to make the summit ascent. 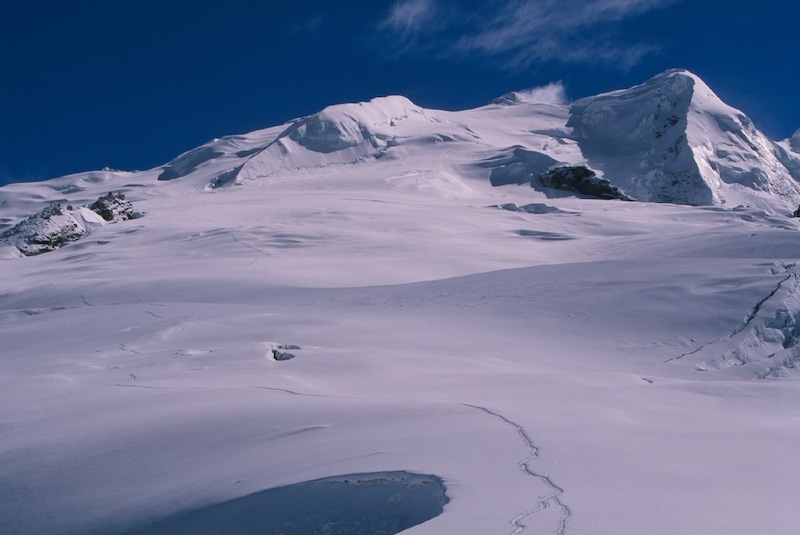 The climb is conducted over three days ascending glaciers that are mostly gentle in angle with the occasional steeper pitch. You will be taught all the skills required to climb the mountains during the expedition, but you need to at least be a strong intermediate skier/snowboarder. The expedition to Mera Peak is enriched with experiences made possible only my long established relationship with the people and places of Nepal. The expedition incorporates a very special range of cultural opportunities and trekking highlights to make this an unforgettable Himalayan journey. The rewards of the journey, coupled with the stunning views from the top, followed by an exhilarating ski or snowboard descent, will make this a journey of a lifetime! It’s an ideal first/second Himalayan adventure with spectacular views of the Himalayan giants on Nepal’s highest trekking peak. 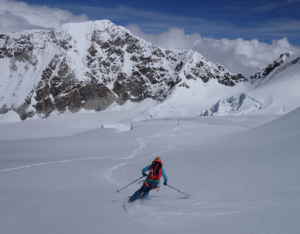 Day 14: Acclimatisation ski tour towards Mera La, 5400m. Return to base camp. Day 21: Trek to Mosom Kharka. Camping. Day 22: Trek to Tetraput. Camping. 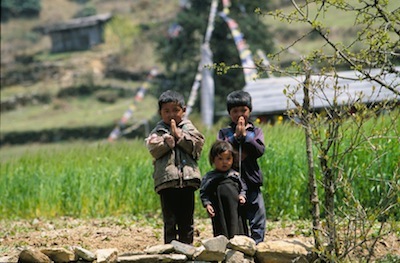 Day 23: Trek over Zatrwa La, 4600m and descend to Lukla. Lodge. Day 24: Fly Lukla to Kathmandu. Hotel. Trip Cost: Custom price depending on group size and comfort/support required. More Pics: Click here to view a slide show of the expedition. The classic Nepal trekking peak, Mera Peak. We ski the lefthand skyline. Skiing off Mera Peak with Mt Everest in the distance!